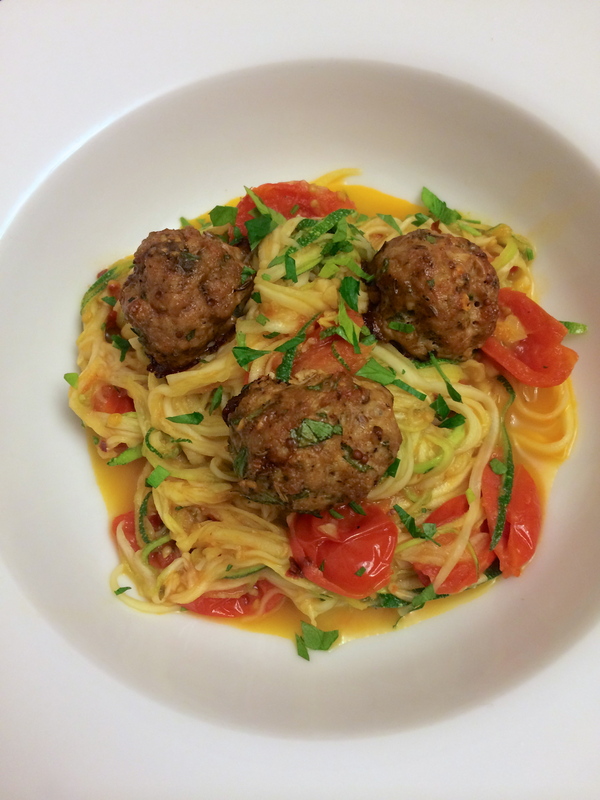 I made this “pasta” dish to go along with the Paleo Mini Pork Meatballs that I made a few weeks ago + it was a match made in heaven. I had gotten this vegetable spiralizer at the start of the year in hopes of replacing regular pasta with veggies as I worked toward my goal of eating cleaner. This could not be easier to make and it’s seriously tasty, never mind how much healthier it is for you! The other cool thing about it is that there really doesn’t have to be any set ingredients for this, it’s a good way to use up whatever produce you have in your fridge! I think the mini pork meatballs are the perfect thing to go with this but some ground turkey season and browned up would be great to mix in with it or even some shrimp would be fantastic! Heat 1/2 tbsp safflower oil in a high-sided sauté pan over medium heat. Once the oil is hot add 1 minced garlic clove + a pinch of red pepper flakes. Stir for a few seconds until fragrant then add in a handful of grape tomatoes that have been sliced in half. Stir occasionally for a few minutes until the tomatoes start to burst and soften. While that’s happening, “spiralize” yellow + green squash. If you want to reduce some of the moisture in the end dish (though I like it because the “noodles” and meatballs soak it up and it’s delicious), you can put it in a kitchen towel and squeeze out some of the moisture. Add it to the pan with the garlic, red pepper + tomatoes and stir for a few minutes to soften and heat through. This made one serving but you can add more or less of the ingredients to make it for more people! 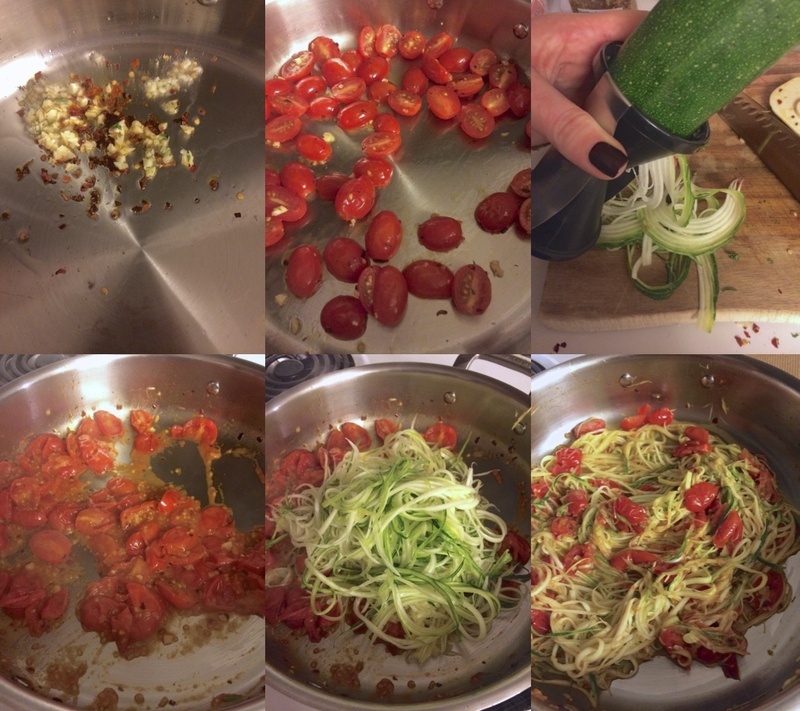 I use the Veggetti – basically the same spiralizer and I love it! I agree, it’s so easy! Isn’t it the best? I love that it’s so easy. Great idea! I’ve been meaning to try zucchini pasta and am glad to see that it works so well! Thanks! You should definitely try… it’s so easy + yummy!